The past two months have been busy and because one book was incredibly long (cough cough Bonhoeffer), I decided to combine both months reading materials. Ok I've been reading a million WWII books lately (ok that's a lie, I've been reading them most of my life but there has been a lot lately). 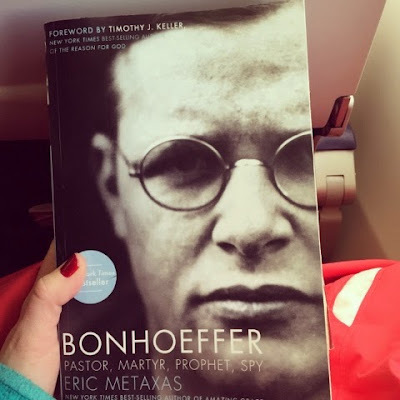 This is a biographical account of Dietrich Bonhoeffer, the German theologian. He fought against the Nazis when they tried to take control of the German Church and he suffered for his efforts. It's an interesting perspective on the war and shed a lot of light on the German resistance against the Nazis. It's a long read but very intriguing. I read Gone Girl awhile ago and have been wanting to pick up more Gillian Flynn books but because they are suspenseful and intense they aren't something you can read back to back. I was absolutely glued to this one. It tells the story of a woman who's sisters and mother were murdered when she was a child. Her teenage brother went to jail for the crime. Now as an adult she decides to take a look at the case and goes on a wild ride to discover what really happened that night. It's not as good as Gone Girl but it also plays on the theme of choices between "right" and "wrong". I found this book in my offices Marketing Library. I'm a foodie and a marketer and this book was the perfect marriage of both of my interests. Sax writes about how food trends come about and why some have had staying power. I especially liked the section on health trends and data and forecasting.